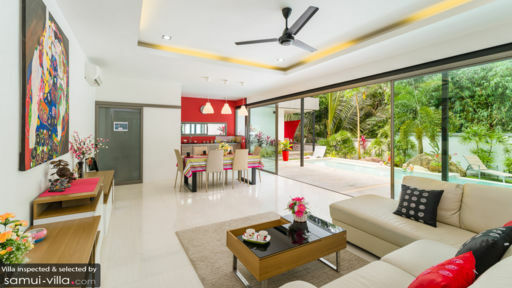 Tawan Villa Samui is a vacation residence that features contemporary tropical design. Efficiently using available space, interiors are appointed with predominantly in-vogue, finely finished timber wood furnishings and fixtures with a few lavish and stylish pieces. Amenities are essentially of hotel and resort grade – to ensure each and every guest’s pure pleasure and indulgence. Truly, Tawan Villa Samui extends to you a cozy escape amidst an atmosphere that’s genuinely homey. The villa has three air-conditioned bedrooms – two in one wing, and one in the other wing. All bedrooms have double beds, as well as dedicated bathrooms with rain showers. All bedrooms also have direct access to the swimming pool. From anywhere you are in the villa, you can – on impulse – jump into the mesmerizing, and glassy waters of the swimming pool for some mindless wading. Or, pull everyone in for some splashy fun and games. From the water, you can stretch out on ergonomic pool beds on the covered terrace of one of the villa’s bedroom wings at one end of the swimming pool. At the villa’s sunny, spacious and breezy common space is the living area. Around its hefty, angled sofas, you can all converge for moments of family or friendly bonding. At the other side of the space is the dining area with its dark wood table for six. Here, you can all indulge in one another’s appetizing signature dishes which you, one after the other, masterfully prepared at the well-equipped, modern kitchen alongside the dinner table. Tasked to render the regular services of the villa is a staff which consists of mostly housekeepers. A laundry helper may, upon your request, be called in. However, her services come with a separate charge. Car rental is also available. 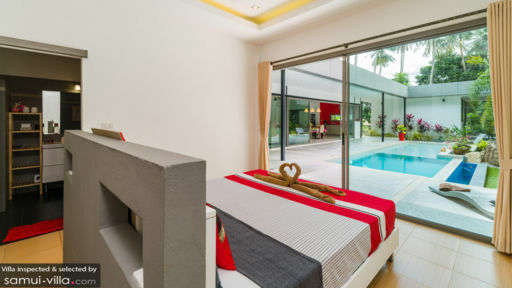 Tawan Villa Samui is situated within the immediate area of Lamai Beach which you can get to on foot and where you can go swimming and even diving. On another excursion, go sightseeing at the Hin Ta and Hin Yai – Grandfather and Grandmother – Rock Formations and at Wat Khunaram where you will find the mummified monk Loung Pordaeng. Then go get yourself some serious retail therapy at the Tesco Lotus Mall and at the Lamai Night Market. On a Sunday, go for a leisurely stroll along the stalls of the Walking Street.